Rock the Blocks is a fun invitational at Kentwood. It’s rock-n-roll themed and some of the coaches dress up. First timer? Read below for more information. Make sure your swimmer arrives with ample time to check-in and warm-up. Coming to cheer the team? Here are the entry fees and there will be a concession stand available. 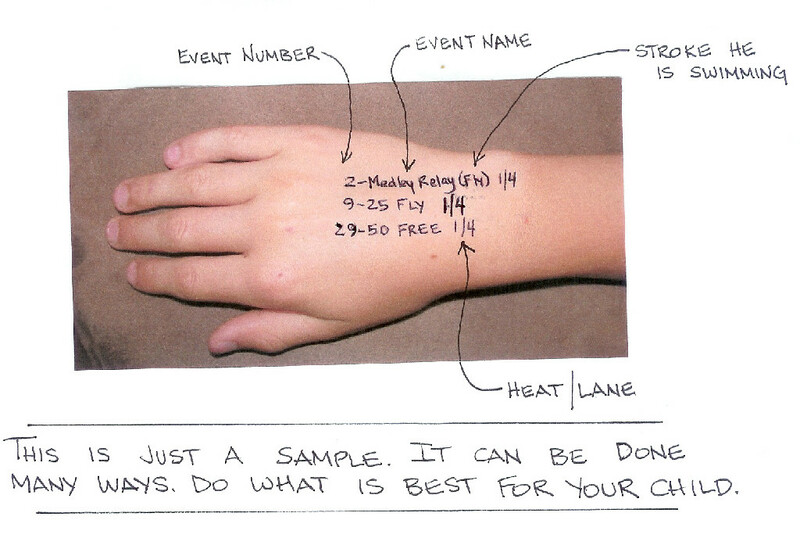 Make sure you write your swimmers events on his or her hand or arm (See below for details). Your swimmer must check in so that the event coordinators know he or she is there. If your swimmer does not check in, he or she will be scratched from the events. Once checked in, swimmers proceed to the locker room and swim deck and find your team and Coach Suann. The team generally sits together and cheers each other on. Coaches will warm up the athletes. Once the meet starts, athletes need to listen for their events to be called. They will be marshaled ahead of time to keep the meet moving. This is where it helps for the swimmer to have his or her event numbers written on his or her arm. Note, we won’t know the heat and lane numbers until the day of the meet. 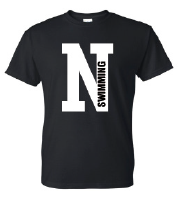 Remind your swimmer they are representing themselves, our school and our community. Be respectful of the facility and other swimmers. Cheer their teammates on and have fun! This is the first competition of the season, swimmers should focus on improving on their own times. Coming to cheer the team? Here are the entry fees and there will be a concession stand available. Remember to watch the Team Calendar for the team schedule. Here is a link to the Team Calendar online. We’ve been invited to participate in the Rock The Blocks Invitational on Saturday 12/5 at Kentwood Aquatics! This is really short notice, so please read this carefully. Entries are due Monday, November 30th at 6:30 PM (tonight). No late entries accepted. This is an invitational. Your swimmer’s entry fees are $5/event and swimmer may swim up to 4 events. You can pick the events your swimmer would like to compete in. If you need help email us and the coaches will give suggestions. no later than Monday, November 30th at 6:30 PM (tonight!). Show your team spirit with NCST Spirit Wear! All current athletes will receive one youth shirt with their registration. These are optional Spirit Wear for your athletes. They make great Holiday Gifts! Get your orders in! No late orders can be accepted. We’ve added adult sizes to the sweatshirts on this order form! This is a paper form you must print to turn in. Turn in to coach or pool office during practice tonight. We’ve been invited to participate in the Rock The Blocks Invitational on Saturday, December 5th at Kentwood Aquatics! Entries are due Monday November 30th at 6:30 PM. No late entries accepted. no later than Monday November 30th at 6:30 PM. Please note the times have changed for practice on Monday, November 23 only. Due to scheduling with the Crossroads and High School Varsity Swim Teams we are changing the practice times for Monday, November 23. Regular practice times resume on Tuesday, then we are off for the holiday break. Be sure to watch the practice calendar for practice times. There are a limited number of practices left. Get your orders in! This is a paper form you must print to turn in. Turn in to coach or pool office during practice. Regular practice times resume on Tuesday, then we are off for the holiday break. Watch the practice calendar for updates. All athletes signed up by November 16th will receive one youth shirt with their registration. These are optional Spirit Wear for your athletes. They make great Holiday Gifts!